For better or worse, I seem to do a lot of my blogging at about 3am. 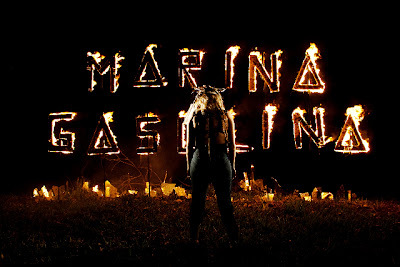 But even after seeing Notion Magazine's "exclusive" free download of Marina Gasolina's debut single 'Leone', I really thought bed should take a precedent. But I'm ready to share the wealth now. You might be familiar with Marina Gasolina from Brazilian funk-dance band Bonde De Role. Marina left the band quite a while ago now and I actually saw her do a bit of a cameo at a London gig a couple of years ago, guesting on a track by Esau Mwamwaya and Radioclit. Speaking of the latter, he has helped produced the forthcoming self-titled debut album from Marina Gasolina as well as co-producing the download below. 'Leone' is twiddly electronica that Daft Punk would be proud of, complete with a rampaging drumbeat. The track itself is a homage to Sergio Leone, the Italian film director, widely considered to be the driving force behind the Spaghetti Western genre, having made films like 'A Fistful Of Dollars' and 'Once Upon A Time In America'. I love me a good music-film crossover. See what you think of the track below. 'Leone' will be released on 29th November on Marina's own Anfetamina Records.